Bhulf Tón CLG: Bhulf Tón CLG Mega Fundraiser! Bhulf Tón CLG Mega Fundraiser! 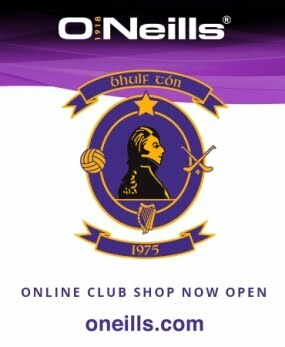 BHULF TÓN CLG MEGA FUNDRAISER: Sponsor a patch of our new pitch at Baile Gibb! €100 secures your name on whatever area of the pitch you desire. Pay or pledge a square. A Master board with all names will be on display at Club Grounds. A raffle for €1k + other prizes for all entrants. Call or text Justin 087 214 5298 or Wendy 087 756 3653 or come to us at training/matches. Please support our Club Development Drive so we can enhance our facilities at Pairc Mhic Eoin and Baile Ghib for our players, parents and visitors!